The ideas! The words! Sometimes writing is so exciting (pardon the rhyme) and the thoughts come so fast it’s hard to keep up. Other times it’s hard work. A mountain of work. Work tainted by despair: will anyone want to read it? Most writers serve a very long “apprenticeship” learning the craft, discovering their niche and finding a way to get their words “out there” in terms of paid publication. 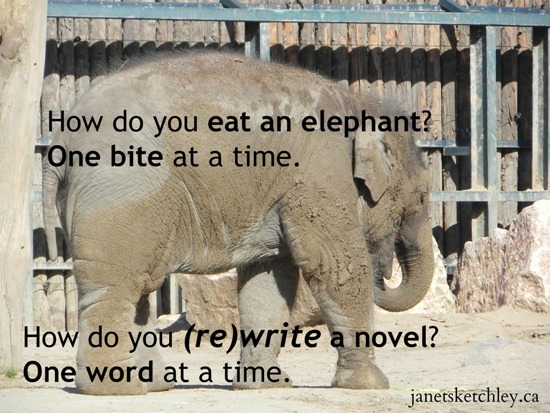 This entry was posted in Writing and tagged elephants, perseverance, writing on November 28, 2014 by Janet Sketchley.